Billionaire Mukesh Ambani (from India) on Monday became the richest person in the world, surpassing American software czar Bill Gates, Mexican business tycoon Carlos Slim Helu and famous investment guru Warren Buffett, courtesy the bull run in the stock market. 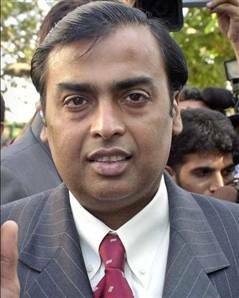 Following a strong share price rally today in his three group companies – India’s most valued firm Reliance Industries Ltd., Reliance Petroleum.Ltd., and Reliance Industrial Infrastructure Ltd – the net worth of Mukesh Ambani rose to $63.2 billion (Rs 2,49,108 crore). In comparison, the net worth of both Gates and Slim is estimated to be slightly lower at around $62.29 billion each, with Slim leading among the two by a narrow margin. Warren Buffett, earlier the third richest in the world, also dropped one position with a net worth of about $56 billion. ~ From: Rediff.com :: Read it from CNBC here. But there were skeptics who thought Reliance will cease to be the Numero Uno after the split between brothers, Mukesh and Anil Ambani, but both are growing in wealth! This is really a good news for every Indian! ← All’s right with the world! Love is only a dirty trick played on us to achieve the continuation of the species.